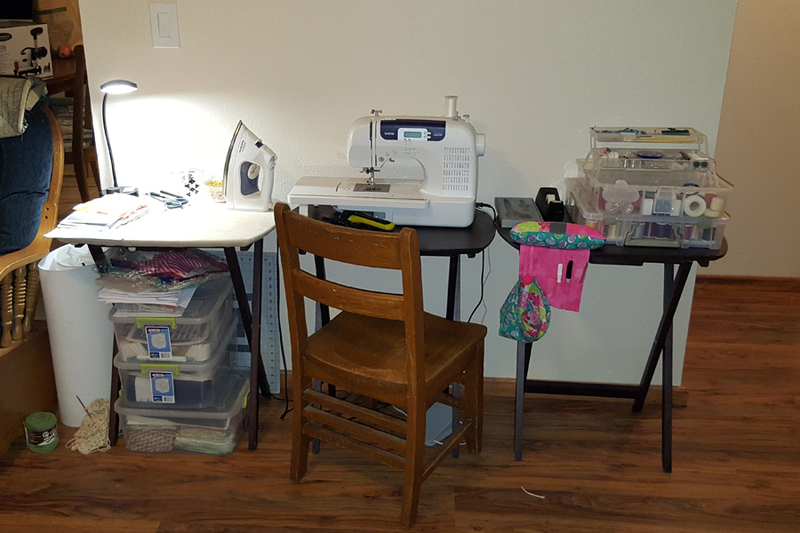 For the entire month of February, the ladies over at Simple Simon and Company are celebrating sewing spaces . . . large spaces, small spaces, messy spaces, and organized spaces . . . even those make shift spaces on top of the kitchen table! As a bonus during “Love Your Sewing Space” month, they are giving away a $100 IKEA gift card. 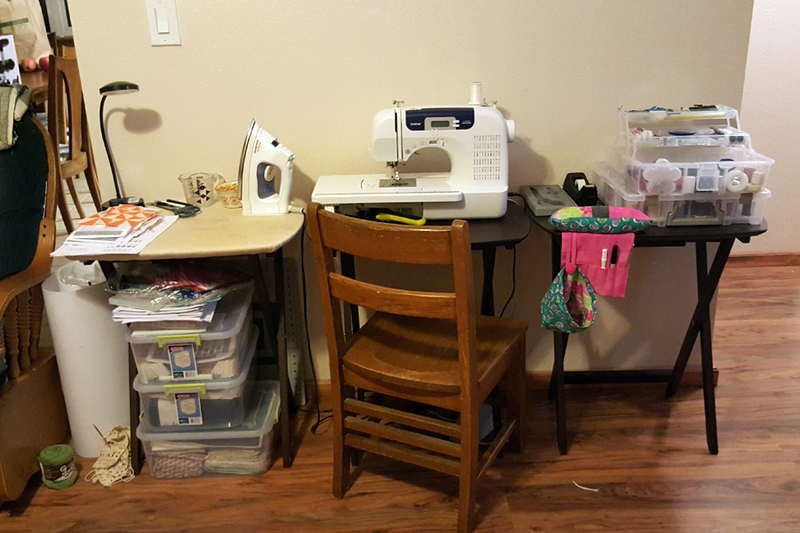 Our house just isn’t big enough for me to have a designated craft/sewing room, and I am okay with that because when it is big enough, it will mean one or more of our kids has left for college. As excited as I am for them to grow up, I am not ready for that quite yet. We do have this short wall that belongs to the kitchen pantry on the left and coat closet on the right, and that area has become my sewing space. I don’t have a dedicated table, either, (I will one day, though), and right now I use several TV trays as my work space. 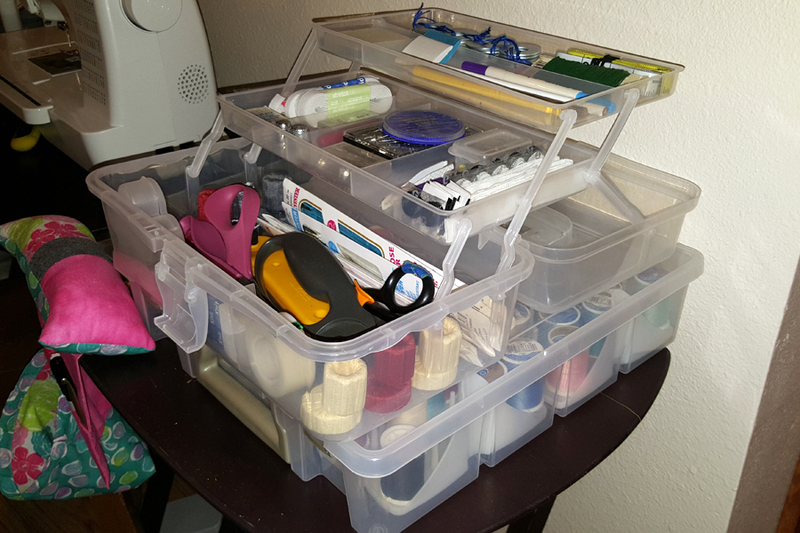 I have one for my sewing machine, one for my thread and tools (I have a much nicer box now, too), and the third one I made into a portable pressing table following a tutorial on Diary of a Quilter which also links to the original tutorial. Another reason I would love to win that gift card is all the clear plastic containers I have holding everything. They work for now, but I really hate how “temporary” they are. Since this space is right in the main living room of our house, I would like to have some nicer bins or storage options so that my supplies are more concealed. This area works well, and it provides enough space that I can easily put projects away when I’m not working on them. When I am sewing, I tend to take the TV tray with my machine on it and pull it out at a 90˚ angle from the pressing table so can watch TV while I sew. Eventually I will get a different chair, too. As is the case with everything I am using right now, this one works great for now, but if I work for much time at all, my upper back really takes a hit. If I could change anything about this space, I think it would definitely be the storage options I have – right now I just don’t have anything. I store my fabric stash in two Rubbermaid Low-Profile Containers under our bed. Projects that I am currently working on each have a clear tote (ugh) and all their supplies are stored in the totes under my pressing table. If I am working on two similar projects, I put them in the same tote – as an example, when I was working on my Chatsworth quilt top, I also had the Moda Sampler Block Shuffle 2015 project stored in that tote, as well. I do have one shelf in our laundry room that holds bigger items like Pellon and my bolt of interfacing, but I try not to keep very much in there. Patterns, buttons, books, ribbon, and other notions are stored directly across the room from my machine in a small console table my grandpa and I built when I was 15. 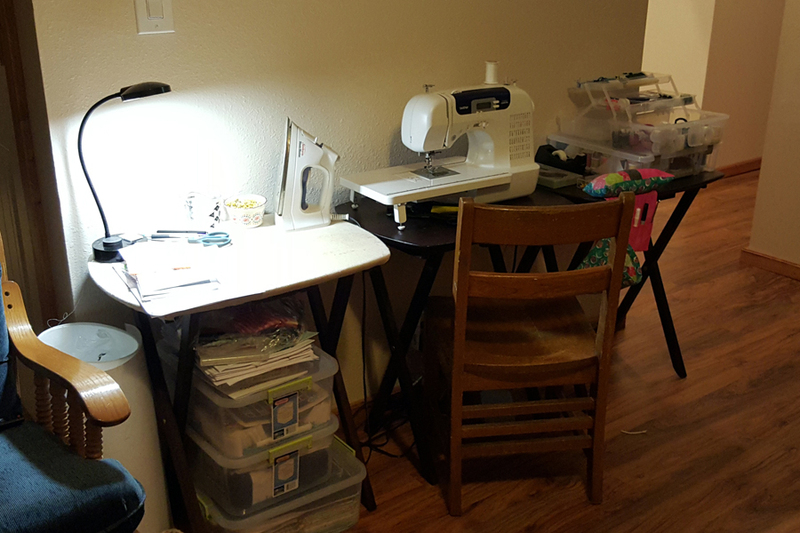 So there you have it – my small sewing space that I love, even though it’s not ideal.